Is the Buckhorn Exchange haunted? 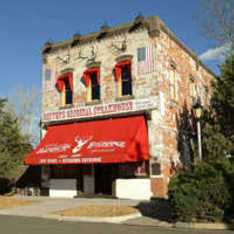 The Buckhorn Exchange is Denver's oldest genuine old west restaurant. The building was founded in 1893 by Buffalo Bill Cody's band of frontiersmen and was one of the first fur exchange centers in the area. The building is still open today as a restaurant, museum and saloon. The building is said to be haunted by the ghosts of the traders that operated here when it was a fur exchange, being in the traditional "wild west" area it was in and the date of its original function, gun fights were not uncommon. How many deaths that occurred in the building itself is unknown, but reports of hauntings include mostly the sounds of footsteps and voices, including conversations sometimes involving several people coming from the bar area, especially when it is completely empty. The ghosts here are also known to be quite fond of moving furniture, as the bar staff have reported numerous times seeing tables being slid across the room.